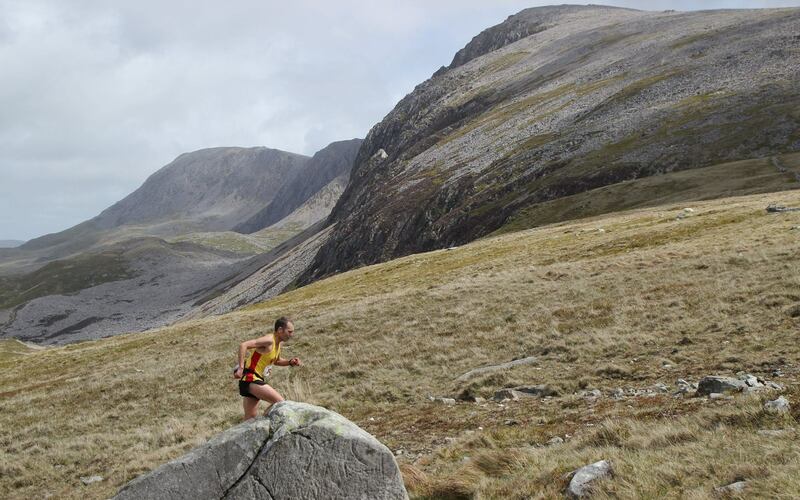 Ras y Gader / Cader Idris Mountain Race. Dolgellau can be found off the A470(T) at grid ref SH728177 (outdoor leisure 23) in the South of the Snowdonia National Park at the head of the Mawddach estuary. Plentiful car parking is available just on the edge of town at the Marian. 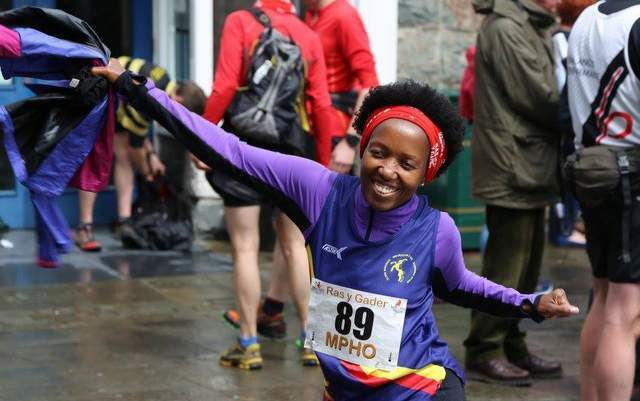 The race covers a distance of approx 10.5 miles, from Dolgellau to the summit of Cader Idris (2927ft) (Category A, Medium), and returns by the same route. Run under WFRA rules. 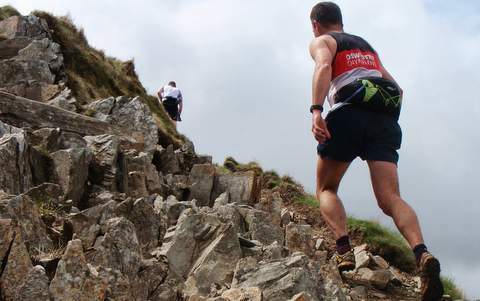 The race leaves the town (SH728177) and follows the steep metalled Cader road (bearing right at a junction) for c.2.5 km to Gellilwyd Fawr (SH707167), the first marshalled checkpoint. At this point the route follows public footpaths to the rear of the Gwernan lake reaching the main Cader car park at Ty Nant (SH698153) in another 2km or so. Ty Nant is a marshalled checkpoint. Water is also available here. 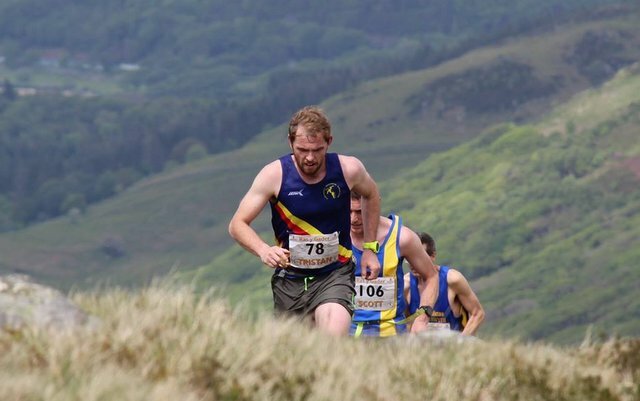 The race then crosses the road and proceeds up the mountain on the “Pony Path” to Rhiw Gwredydd (SH691136) in another 1.5 km, just below the 2000ft point. Rhiw Gwredydd is a main race checkpoint and cut off, all runners must pass the marshals here, where numbers are recorded. In the interests of competitor safety and not to keep marshals on the hill a time “cut off” of 1hr 15mins from the start will be enforced at the gate/stile at the Rhiw Gwredydd check point. 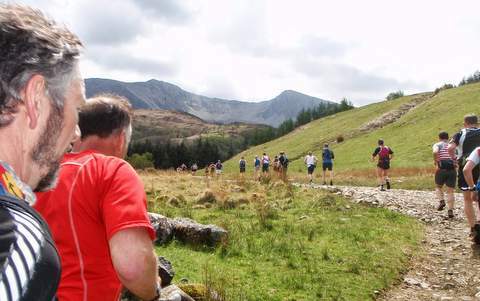 Any runner failing to reach this checkpoint in the allotted time will be retired from the race and the competitor must descend the mountain. The route then follows the main footpath to the summit of Penygadair (SH711130) which is very much unmarked. Marshals will be at the summit, where once again race numbers will be noted. The return leg is a reversal of the ascent. All runners must pass the key marshalled checkpoints on the descent back to town. Marshals at the above 4 key checkpoints will have communication with race HQ in case of emergency. Click on Map to see the route. Race HQ will be based in the Free Library, just off the town square in view of the start/finish area. If in doubt, ask! This will also be the venue for registration, toilets and post race food. Registration will close at 12:40. 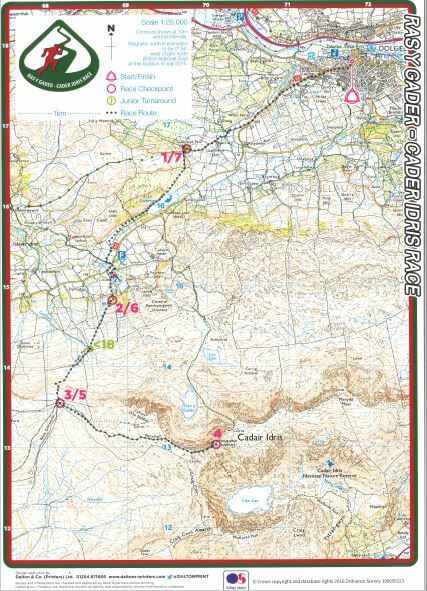 Under WFRA rules ALL COMPETITORS MUST CARRY full waterproof/windproof body cover, map, whistle and compass (all available from Cader Idris Outdoor Gear). 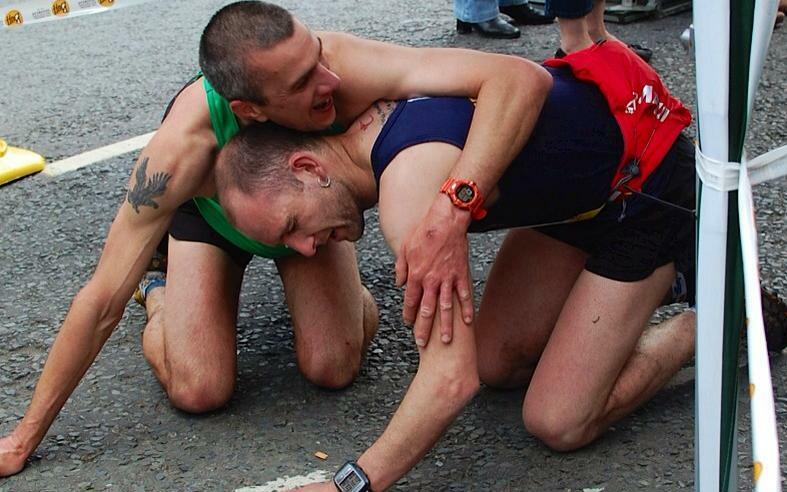 A random kit check will take place as runners finish and anyone found without the required kit will be disqualified. An up to date weather forecast will be available at HQ on race day. Any runner who has to retire from the race must: Report to the nearest checkpoint so race control can be informed AND report in person to race control/finish on return to town to de-register. Failure to follow these simple procedures will result in the competitor being assumed lost and the emergency services being mobilised. Please don’t let this happen by accident. Refreshments will be available after both the junior races and main race, free of charge to competitors, in the Free Library. Please bring your race number to get your free scran. The main race prize ceremony will take place, either in the main square or Free Library if it’s raining, at approx 1600 hours. An announcement will be made before they begin. A series of junior races are run throughout the day on minor roads closed to traffic. U/14 (c.3km) and U/16 (c.4km) races at 13:35. U/18 (c.10km) race, which follows the lower part of the main race commences with the main field at 13:00hrs. Finishers medals are awarded to all junior race entrants. Entry for all of the junior races is on the day only. 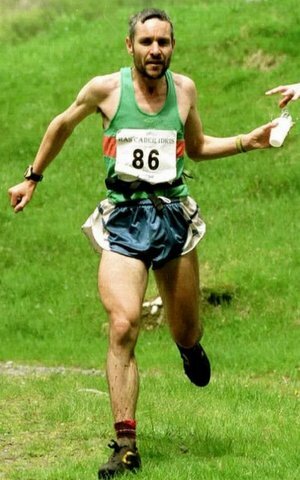 Five times winner of Ras y Gader Colin Donnelly from Eryri Harriers set the record in 1996, which still stands at 1:21:18.
or PM us on Facebook.